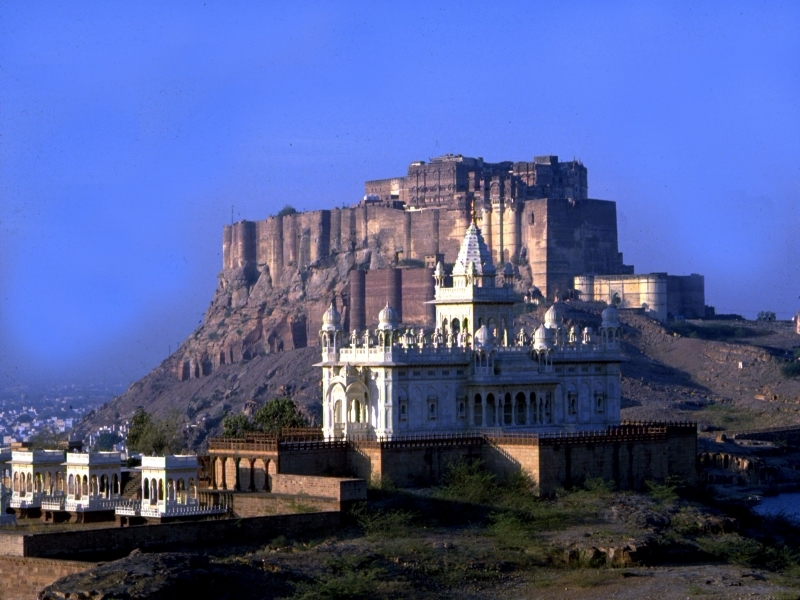 To the left of the Mehrangarh Fort complex is the Jaswant Thada of Jodhpur, Rajasthan. It is a 19th century royal cenotaph built in commemoration of Maharaja Jaswant Singh II, the 33rd Rathore ruler of Jodhpur. The son of Maharaja Jaswant Singh, Maharaja Sardar Singh, in the memory of his father, built the Jaswant Thada. The cenotaph has two more tombs within it. Near to this are the royal crematorium and three other cenotaphs. Famous Jaswant Thada in Jodhpur, India is an example of architectural brilliance in India. It is a white marble memorial, built out of intricately carved sheets of marble. The carving shows the genius of the sculptors. These stones are extremely thin and polished. As a result, the outside surface of the monument emits a warm glow when the sunrays fall on its surface. There is also beautiful marble jali work on the cenotaph. You can have some nice views from the terrace in front of the cenotaph. The cenotaph of Maharaja Jaswant Singh displays portraits of the rulers and Maharajas of Jodhpur. The main memorial has been built like a temple. To visit the Thada you have to go through the rocky hills. This also lends a mystic aura to the whole visit. Do make sure to visit this architectural delight while on a tour to Jodhpur, Rajasthan. Been to Jaswant Thada ? Share your experiences!